I suppose I do not have much of an excuse for not updating the newsletters as often as I should, even though I really enjoy writing the newsletter. Clinically, I have been busy both in the NHS and in my private practice. At Whipps Cross Hospital, we are now well into the partnership with Barts NHS Trust and Newham NHS Trust to form the largest organization in the UK; this is Barts Health of course. The immediate impact on my NHS practice was an increase in the number of referrals with Vitreoretinal diseases, which I was very pleased about. I have been fortunate to have a very dedicated new training Vitreoretinal Fellow who is most reliable, so a definite budding Vitreoretinal Surgeon. I have also been busy pursuing my research interests and I am glad to say that we have had several accepted publications, spanning diabetic retinopathy, myopic eye disease and macular hole surgery and choroidal imaging. Finally I have pursued my interests as an examiner for the Royal College of Ophthalmologists, something I started 3 years ago and I enjoy thoroughly. At home, it is been a pleasure watching our new arrival Raphael develops amongst his brothers Adam 9 and Daniel 6. As always I would welcome your ideas for topics for the next newsletter. Ophthalmologists generally love new tools and I am very keen on novel technology. So we have moved from having a retinal camera (which we still need of course) to having Optical Coherence Tomography (OCT) scans, which can image the retina live with a fantastic amount of detail. For the management of patients with retinal disease, we used to rely on fundus fluorescein angiography (FFA), a test which involved the injection of a fluorescent dye into one of the veins of the forearm. Whilst we still need FFA, we would now monitor for further change using OCT, so no need for more injections. OCT scans take 3-5 minutes, do not involve an injection and give plenty of information, which sometimes cannot be seen clinically. 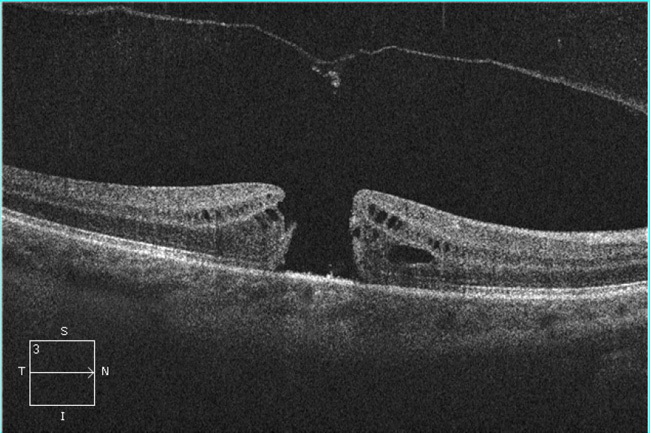 OCT scans because available about 10-12 years ago, but today form part of any retinal practice. What is most impressive, is that OCT imaging not only allows the Ophthalmologist to image the retina, but it is also possible to image the layers behind the retina called the choroid, as well as the optic nerve. Their use has therefore spread to the glaucoma specialist as well as the neurologist. New OCT scanners are so developed, that some can combine OCT and fluorescein angiography, and the very newest machines can perform OCT/angiography without the injection of a fluorescent dye! The new OCT/angiography instruments are only just being marketed, so not available widely just yet. For those with retinal disease and especially macular diseases such as macular hole, epiretinal membrane, diabetic retinopathy and macular degeneration, an OCT scan today would be a routine standard investigation. OCT not only image the retina at presentation, but allow the clinician to monitor progress and response to treatment. In the case of a macular hole, it may show closure of the hole after surgery (figure 1), but in the case of diabetic retinopathy, it would show improvement (or not) of the macular thickness and macular oedema after treatment with laser or intravitreal injections (figure 2). Most patients in my clinic would therefore have the vision check, followed by eye drops to dilate the pupil then a OCT scan before seeing me. 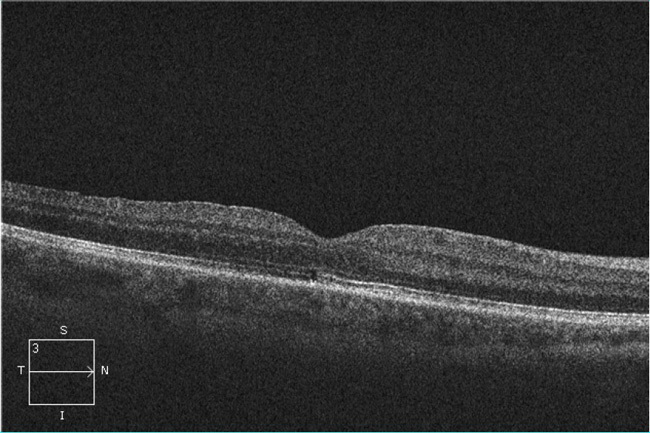 Figure 1b: OCT scan of the retina 6 weeks after vitrectomy surgery (same eye as in figure 1a): the macular hole is closed and the vision has improved already by 2 lines. Figure 2a: The OCT scan on the left in a 57 year-old patient with reduced vision due to diabetic macular oedema shows a large cyst in the retina. The OCT scan on the right (3 months after treatment intravitreal Lucentis) shows total resolution of the cyst and improved vision. Along with the new developments, are software developments, which allow a clinician to view all tests on one computer station, without the need to run around between machines to view results? More impressive, is that software developments with networking capabilities allow the integration of imaging done in clinic with equipment elsewhere such as the operating room and operating microscope. In the setting of cataract surgery for instance, and in particular if planning to implant a toric intraocular lens implant to correct for astigmatism as well as well remove the lens opacity (the cataract), the measurements for the lens are done in clinic using a biometry instrument. The newer biometry instruments take a picture of the eye at the same time. The exact axis of alignment for the toric lens implant is determined after measuring the degree of corneal astigmatism. This information is relayed via appropriate software to the operating microscope via the hospital network. The surgical plan uses the image of the eye, to identify the 0-180 reference plane and maps on the microscope image the axis of alignment for the toric lens implant. This not only helps more accurate placement (to correct astigmatism) of a toric lens implant, but also removes the need to mark the eye pre-operatively (which we would normally do to identify the 0-180 reference plane). I can’t hide the fact of course that hospital managers do not like it when I go to their offices, as I am constantly after funding for more equipment, software or as they call it “expensive gadgets” … but this is what makes Ophthalmology so special. In my next newsletter, I will discuss my involvement with a program for phaco cataract surgery and implantation of an intraocular telescope (this is different form the standard intraocular implant) in patients with advanced age-related macular degeneration. This is a new development, which will probably make a significant difference to at least some patients who have this difficult condition.